You cannot delete this version if it is used by: Process History. 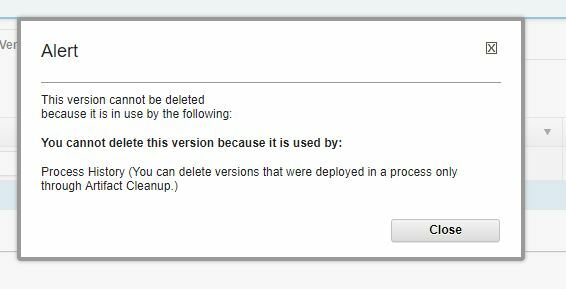 But You can delete versions that were deployed in a process only through Artifact Cleanup. You can configure the server to reduce the number of component versions by archiving old versions. Cleanup settings for specific environments. Click Settings > System Settings. Under Artifact Cleanup, in the Days to Keep Versions field, specify the minimum age in days to save a component version. For example, to keep all component versions that are 5 days old or newer, specify 5. If you specify -1, all versions are saved, regardless of the setting in the Number of Versions to Keep field. In the Number of Versions to Keep field, specify the minimum number of versions to keep. For example, to save the five most recent component versions, specify 5. If you specify -1, all versions are saved, regardless of the settings in the Days to Keep Versions field. When the server runs the cleanup, it deletes or archives all component versions that are older than the minimum age. However, the server retains at least the number of versions in the Number of Versions to Keep field. In the Archive Path field, specify the path of the location on the server to write compressed versions of each version that is archived. If you do not specify a path, then the server does not store the component versions that it removes. To preview the component versions to be archived the next time that an archive file is created, on the System Settings tab, click the Preview Version Cleanup link, and select a component.